Due to the extreme weather event we are facing right now I'm pausing the Gentle Domesticity book study until next week. It seems living right near the dam is a blessing as the river is straight and parallel to where we live just down from the spillway, and though the river is high with waves and is breaching it's banks considerably, the dangerous place is further down river where it begins to turn corners and has caused extreme flooding which is still rising. There are two types of flooding here. The worst are floods due to swollen rivers because you cannot pump it away - it rises around you and there is nothing can be done to stop it. You have to leave and wait for the flood waters to subside and emergency services to declare the areas safe to re-enter. The other flooding is by the extreme rains we have had for nine days now. That's us. As long as we keep these four pumps running, the water kept under the door and the storm drain out front can carry it away then we have saved our home. Everything is wet, mold is growing all over the place (so we have to toss those things outside for permanent removal once the monsoon is over) and right now my husband is ripping up carpet from his study where the water has come through a crack in the concrete slab our home sits on. Then he'll remove the carpet from our bedroom as the odour is hard to cope with and sleep is made even more difficult. Staying awake and alert to keep pumps running takes its toll so when there's a weather break we try to sleep for a couple of hours. The rest of the house is tiled, praise God. Internet drops in and out so this blog post has taken a while, but we've not lost power even though those up the road have. I'm not replying to emails or messages so please don't be offended - there's enough happening and a blog post answers questions far easier. Keep praying for everyone affected by this catastrophic flooding which is still not over. And also pray for mental health, physical health, and recovery time afterwards. Just imagining that once this has cleared people will be expected back at work means a lot of mentally and physically weakened lives will be stretched even further. Blossom and Ross opened their home to a family who had no power and were surrounded by flood waters; a sole man we saw at the dam this morning was filling sandbags for anyone who needed them because he 'needed to do something'; people everywhere are offering food, shelter, clothing to those in need. They are just a few of the many good stories from around here. but we need to hear more about the everyday heroes, the simple folk doing small things that mean more than they will ever know. We need our hearts lifted when they are heavy and our eyes drawn towards that which is kind and gracious and brave. I still have this month's free pattern ready for you to download and make, and the message fits right in with what I'm seeing and hearing about in our town right now. 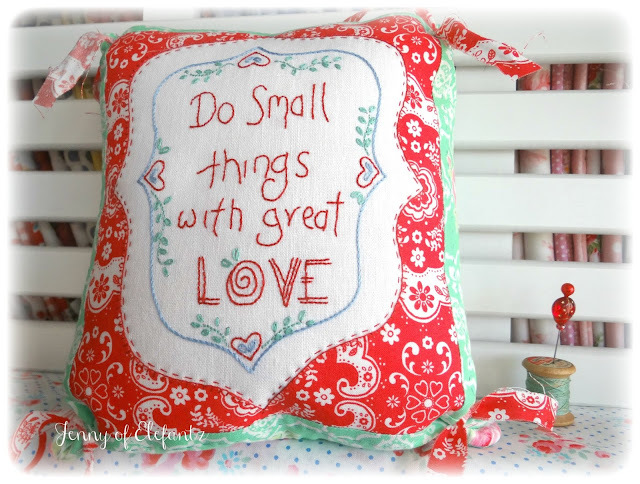 Normally I encourage making gifts for others, but I think this is one message we all need close by so how about stitching this for a frame in your home, or complete it as a small sack pillow as I did. 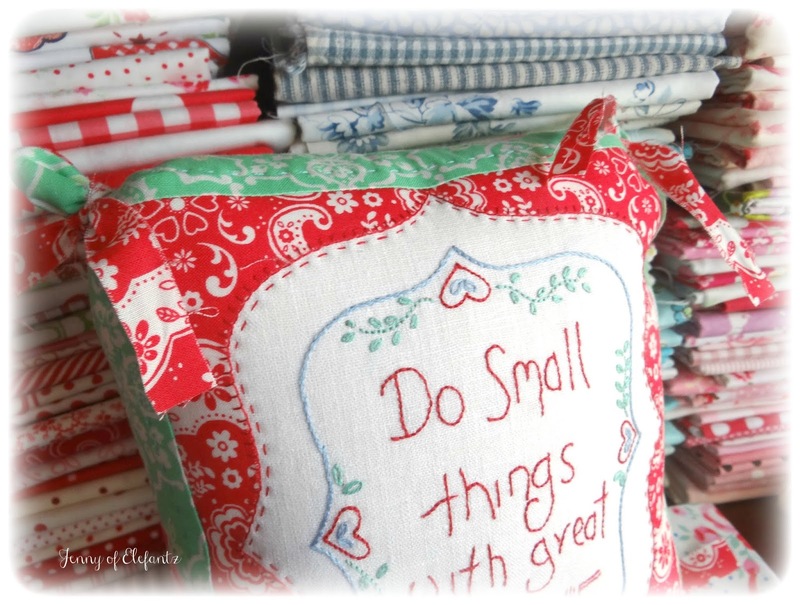 The sack pillow pattern is included with the stitchery. 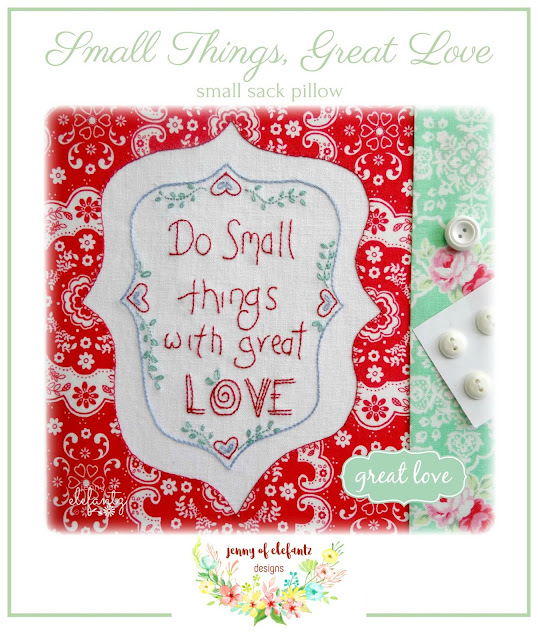 'Small Things, Great Love' is a free download HERE until March 3rd. We'll keep plodding along today trying to clean up the various areas inside and out between the storms. Reports are that until midnight Monday there will be no easing of the flood surge from the dam and river so many thousands of people will not be able to access their homes the way I can. Blessed does not fully cover how we feel. Monsoon at the top of Australia, bush fires at the bottom. God bless YOU wherever you are, whatever situation you're facing. I'm praying and for sure thousands of others are too. So glad for the update. You and the mister are in my heart and thoughts. Not expecting an answer just want you to know that you, Mr. E, Bob the Dog, and the cat (can't remember her name!) are in my thoughts and prayers. Glad to hear your news, it sounds like encouraging. Keep hanging in there..good that you are in effect - upstream! Praise God! So good to hear from you and that you are safe so far. I'm praying that it will continue so, and for all the others in this 100 year event. And here in the US - it's dangerously cold weather as low as the -50s from the Midwest to East. Thank you for your prayers for my fellow citizens. We're in So California and not having such cold weather. Thank you for the update Jenny. You and the other folk up there are in my prayers. Stay safe and we look forward to future updates. I am so pleased to hear from you, Jenny. I have been trying to find out if your suburb is flooded. If my girl was still at Uni up there her place would probably have been flooded as the suburb she lived in has gone under I believe. Praise God that you are safe. I have been wondering how your beautiful fabrics were coping with all the humidity. I hope they don't go mouldy. Yikes! So glad to hear you are in a safer place regarding the river, the dam and flooding. I'm so glad you are only having to deal with rain and not the river water as well. Praying for you both to get some rest and for God's continued protection over you, your community, state and country. Also praying your health will hold and you won't be plagued with migraines from the mold or exhaustion. Sending love and prayers. We too are dealing with cracks in our foundation, nothing akin to yours though. My daughter and family are living where you are too but don't know yet how bad it is for them. Continuing to pray for you and your neighbors! 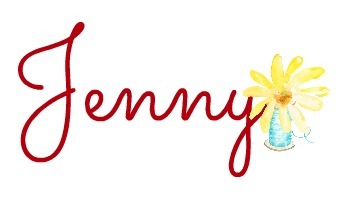 Dear sweet Jenny, you and your family are in my thoughts and prayers. May the Lord's hands of strength and protection be on you and your family and the others affected by the rains. Glad to hear you are all doing okay. Our thoughts are with everyone effected in the North and South. These times try us, however, humans are remarkably resilient and many step up in times of need. We all need to pull together and act with kindness. Bless all those who do!! Praying for your continued strength in these unsettling times. God is always there to lift us up when we are down. At least you & hubby have each other to lean on. One bright spot in a difficult situation. Take care. So glad you are safe, Jenny. We evacuated our Idalia home on Saturday and I just read there is no home in Idalia that doesn't have water flowing throughit. We are just heartsick but so grateful to wonderful friends who have welcomed us into home with open arms, for as long as we need. Thanking God for your safety. Will continue to lift you and your fellow countrymen before Him. Sending much love in Christ's name. Oh Jenny this is answered prayer right here - and the prayers continue! I'm praying for everyone impacted by this terrible disaster. Good to hear that folks are pitching in....that's what we're about. Thank you for the lovely pattern, sweetheart, be safe. You're continually in my thoughts and prayers. Thinking of you and your community in these difficult times. So very relieved to hear your update. Relieved to hear your safe. Take care. Thank you for posting Jenny. You and your family have been on my mind hoping you are ok. Good to read that Blossom is doing ok too. I have been praying for you. Love you my sweet Gentle sister in Christ and Stitchery. Praying for you constantly and your family and all of Townsend Australia. Praying for your health as well. I have been so worried about you. Your update was a blessing to read. You and Mr. E take care of yourselves and home the best you can my sweet friend. 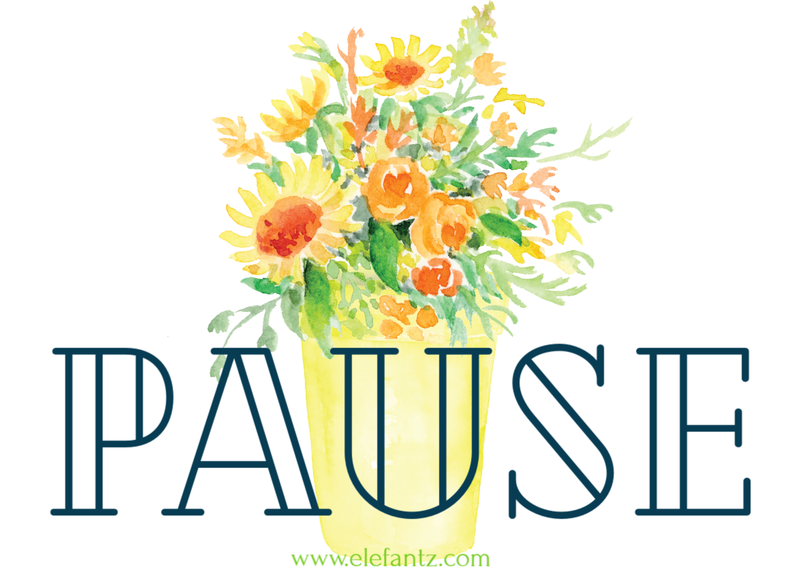 The blog and group will be here waiting and praying for you patiently. Thank you for such a beautiful and gracious gift. Jenny your heart is so full of kindness . This world is a much better place with you in it my Dear. We are all so truly blessed to have you in our lives. Hugs and love being sent you way. Praying for you and all involved! Praising for His blessings in the midst of it! Just letting you know we haven't stopped praying! Sending hugs! Love to you Jenny, and gentle hugs. Prayers continue. Continuing to keep you and your family in my prayers as well as the rest affected. Sending prayers your way. Thank you for the update and the pattern! Jenny, praying for you and community. Take care, and as you know, God is faithful. Thank you for the pattern, I love it and think the pillow shape is too adorable. I hope to start on it tonight. I read this morning that one area received something like 923mm of rain in a 7-day period. That's 36+ inches of water (for us Americans)!!! Stay strong, and glad you are relatively safe. I'm so glad to hear you are safe - when I heard on the BBC news ( I'm in the UK) that they had had to open the floodgates on the Dam I feared the worst for you. The photos of crocs on people's drives are scary, and I know the rains are still with you, but the Aussie battler spirit and everyone's prayer will see the whole community through. My goodness! I've lived with major earthquakes, tornadoes, & brush fires. Still, water/floods scare me the most. I'm glad you're safe. Take care & I pray you'll dry out soon! So glad to hear you are safe and still in your home. What you are going through in your home is so similar to what we went through in 2005. Our flooding was from standing ground water because we had had so much rain. WE have basements and the water started coming in through the cement. WE lost all the carpet and had to tear out all the walls four feet up from the floor. Not fum. Your town was on the tv here last night, all the way in W. Canada. Some people have it relay bad and have lost so much. Will be thinking of you and sending positive thoughts to you. God has blessed you, Jenny, and I'm still praying for your family and all the people around you. Thank you for relating some of the good stories. Townsville was mentioned on the BBC news this morning - it sounds terrifying. Thank you for the update - I am glad you are just about safe although the mess and mould must be very disheartening. Know that even on the other side of the world we are concerned for you and willing the weather to let up so recovery can start. With no surprise, Jenny, you have found the good in this difficult time. Yes, God loves us and takes care of us through trying times. Like many others, over the weekend I saw TV reports of the Australian fires and floods and the devastation they have left behind. Blessings to you and Ross, as you continue on through this. Stay Safe! I am so glad to hear from you, and to hear that you are still at home and not in the midst of those flooded roads we see on TV. We will continue to pray for the whole area and thank you for that wonderful pattern. It is amazing to see how people come together, and that impromptu boat ramp created so that everyone with a boat was out rescuing people! I was so happy to see your post today, Jenny! You've been on my heart and in my mind a lot! Thanks for taking the time to update here and even post a pattern in the midst of your great trial. You are a very special person! I'm hoping by your next post, things will have calmed down a lot for you. continuing to pray humble prayers with great love Jenny, for all. Thinking of your family and you as well as all the other folk going through this Monsoon. I'm praying for continued safety for your family and town. Thank you for keeping us updated and for the new pattern. May God continue to give you peace through the storm. The monsoon flooding and bush fires made the national news in the US last night, and I am relieved to know you are staying ahead of the flooding. It must be exhausting to have the constant worry, and I hope you are blessed with sunny skies soon. Praying for you and your area. We are getting some pictures here, in the States, and the reporting is of the flooding in your area and the horrible drought in southern Australia. God bless you, Jenny. Stay safe. So grateful to hear you are all safe. I watched the opening of the dam last night on the news on telly and was horrified at the volume & power of that water. Crumbs those fires in Tasmania are horrendous too. Glad to hear you are okay. To think I am complaining about our -40 (C) and - 50 windchill! MAy you stay safe and reasonsbly dry. Praying for you and your family and those in Australia affected by floods and fires. Glad to hear you and your husband are ok and I hope the monsoon flooding and fires end so you can get everything cleaned up and you can get back to a normal like. Hi Jenny - I'm not sure if this will help but last week while I was still in Arizona, USA, I read that Oil of Cloves in a spray bottle of water kills mould. That's all I remember - don't even remember the formula - but the idea might lead to something useful. Oh, I do remember it was used to kill mould naturally in the bathroom on mouldy tiles. It wouldn't smell too bad, really, and it would be natural so no chemical reaction. I haven't used the idea myself yet but someone reading this might have more information to help you. Oh My Goodness, I lived in PNG for five years and I know just how quickly that covering of black mould can grow. Thank you Jenny for taking the time to treat us special! Giveaway is like going to the mailbox and getting something fun?